The Israeli Defense Force reportedly wants to close a loophole allowing soldiers to quit on psychological grounds. Around one in six Israeli male servicemen leave before their service ends. A senior officer within the Israeli Defense Forces (IDF) said that almost 50 percent of those soldiers leaving the army before the end of their three-year terms did so due to psychological reasons, Israeli newspaper Haaretz reports. The IDF does not accept people who have severe mental health problems. It does not distinguish between mental health and medical issues, though the force stated that over the last few years, around 7 percent of males eligible for the draft and 3 percent of women have been exempt from service due to medical issues. They want to reduce the current dropout rate, which is currently over 16 percent, to less than 13.5 percent for men. The current dropout rate for women is 7.5 percent, which they want to reduce to 4.5 percent. However, despite this drive, the IDF is adamant that those with genuine problems will not be victimized. “Sick people need to get treatment, but if it’s possible to ensure ongoing treatment and support [the soldier] in remaining in his job, we’d prefer that to sending him home, including for combat soldiers,” a senior IDF officer told Haaretz. There has been an increase in the number of troops leaving the army citing psychological problems in recent years. A senior officer added that half of all soldiers who drop out did so in the first six months of their service, while non-combat troops, such as those involved in administrative roles were more likely to quit compared to those on active duty. Sociologists believe that the IDF’s intentions to try and draft as many men and women as possible can prove to be counterproductive. Experts believe that some people are simply not suited to serving in the army. Due to the importance of the army as it is seen as a stepping stone to better job opportunities, the Israeli authorities try to push as many people as possible into military service. “The army is the biggest 'social worker' in the country and the price paid is the dropout rate. 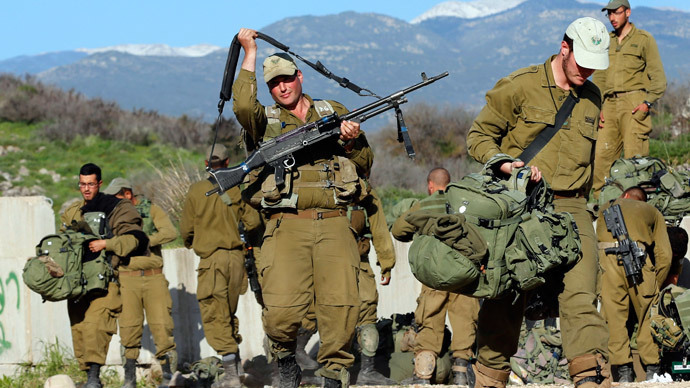 Dropping out is a function of whom is drafted, what conditions they are given during their services and under what conditions they are released," said an officer in the IDF Manpower Directorate, according to Haaretz. Experts also believe that the army’s classification scheme based on test results is also part of the problem. Those with high scores are given the best jobs, while those with lower scores are given “blue collar” jobs. Last year saw the number of suicides in the Israeli army double after the figure reached an all-time low in 2013. Seven Israeli soldiers committed suicide in 2013, while in the following year, 15 troops took their own lives, according to the military’s latest figures, which was reported by the Jerusalem Post. “We have not noticed any link between cases of suicide and army operations,” a senior officer in the IDF’s Personnel Directorate reportedly said, adding that the army is “doing all it can” to prevent suicides. Dropout rates from the IDF fell from 2006, when 18 percent of men and 4 percent of women were not completing their service. Figures from June 2013 show almost half the women of draft age do not enlist at all, and the figure is one in four for men. Religious reasons were cited as the main reason for men and women not enlisting.